Doc Webb dreamed up Walmart even before Sam Walton did. 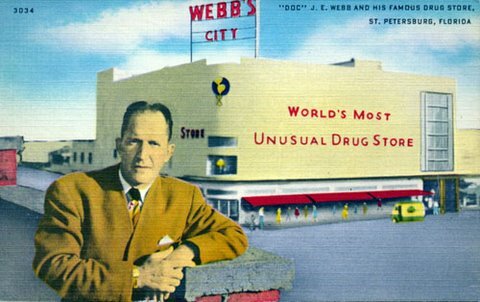 Webb's City was a one stop drug and department store in St. Petersburg that operated between 1925 and 1979. At its peak it had 77 departments and covered 7 full city blocks. Doc Webb (James Earl Webb) was born in 1899 and died in 1983. His motto during years of operating the store was "stack it high and sell it cheap". Years later this same philosophy was used by Sam Walton and his Walmart stores. Doc Webb had a natural flair for promotion. For example, in the 1940s and 1950s, he sponsored beauty contests. Eight beautiful young women were chosen each year from hundreds of competitors. 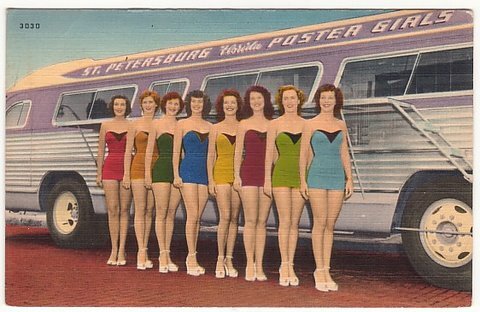 The winners would then make a country wide tour in a specially designed bus giving publicity to Webb's City and Florida. At one time Webb's City had 1,700 employees. The store had a hardware department, gift shop, meat market, beauty salon, travel agency, clothing departments, cafeteria, coffee shops, soda fountains, and a drug store. Sounds like a Walmart, don't you think? Although Doc could beat anybody's price - and often did - Webb's City was not just a shopping destination. It was also one of Florida's leading tourist attractions during the 54 years it thrived in downtown St. Pete. I visited the place in the late 1960's, and it was unique. In the final years of it's operation, it's low prices and location attracted a shopping base of senior citizens and African Americans. Webb's City became the subject of boycotts, pickets, and sit-ins protesting the store did not hire enough African Americans in proportion to it's African American customers. New shopping centers, K-Marts, and Walmarts began to pop up and the days of Webb's City were numbered. Webb's City finally closed in 1979. Doc died 4 years later.